14-year-old Tomakazu HARIMOTO has shocked the sporting world by beating the current World and Olympic champion MA Long in the Seamaster 2018 ITTF World Tour LION Japan Open quarter-finals. Harimoto celebrates one of the most amazing results in table tennis history! HARIMOTO, who last played MA as a 12-year-old losing 4-0, showed how much he has improved over the past 2 years, defeating the man who has been basically unbeatable for the last four years, 4-2 in front of a sold-out crowd in Kitakyushu, Japan. The world number ten was untouchable in the first three games, racing to a 3-0 lead and leaving one of the legends of the game in shock. MA, who won the China Open last week was able to recompose himself to bring the match back to 3-2. HARIMOTO was not going to lose his chance at making history and won the sixth game to put the crowd into hysterics and causing shockwaves around the world. Next up for HARIMOTO is LEE Sangsu from Korea in the semi-finals tomorrow morning, with the winner playing the winner of the other semi-final between London 2012 champion ZHANG Jike (CHN) who is on a comeback trail after nearly a year out with injury, and the evergreen former world number one Timo BOLL (GER). The women’s competition will see Chinese team mates WANG Manyu and LIU Shiwen battle it out for a final position. This match has extra significance for WANG, who will become world number one for the first time if she wins. The other semi-final will be between the in-form Mima ITO (JPN) and Chen Xingtong (CHN). The battle for Women’s Doubles gold will see the duo of LIU Shiwen & WANG Manyu (CHN), who will have to recover from their singles semi final clash earlier in the day, and GU Yuting & MU Zi (CHN). The Men’s Doubles final will be between JEOUNG Youngsik & LEE Sangsu (KOR) and LIANG Jingkun & ZHOU Kai (CHN). At the Mixed Doubles final, LIANG Jingkun & CHEN Xingtong defeated the 2017 Mixed Doubles World Champions to win the second ever ITTF World Tour Mixed Doubles event. The Chinese pair were too strong and slick for the local heroes of Kasumi ISHIKAWA and Maharu YOSHIMURA, winning in three tight games 11-9, 11-9, 11-9. 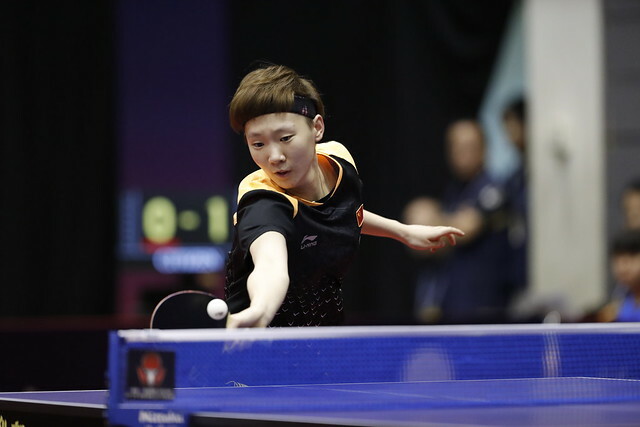 There has only ever been two ITTF World Tour Mixed Doubles champions, and CHEN Xingtong has been the partner in both of them after her and LIN Gaoyuan won gold last week at the China Open. Commenting on this, she stated: It was different playing with Jingkin instead of Gaoyuan, but both are amazing players and good to play with. It is great that I was able to win my second World Tour title in two weeks, I am very proud! Despite sellout crowd witnessing the Japanese doubles pair lose, they still enjoyed the fast, action packed spectacle that they will again see in Japan at the Tokyo 2020 Olympic Games when Mixed Doubles makes its Olympic debut.